A Guinness World Record judge on Saturday named St. Paul the home of the "the largest Lite Brite picture" ever. 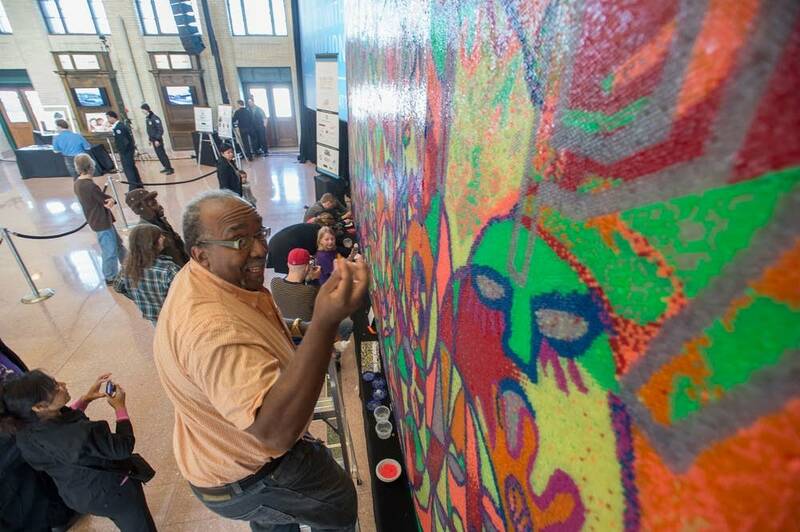 The Lite Brite mural, 12 feet tall by 24 feet long, made its debut at the Union Depot as part of the kick-off of the Minnesota Idea Open Forever St. Paul Challenge. It's a contest to find the best idea to improve St. Paul. The ideas submitted will be narrowed down to a handful, and people at the State Fair and other venues will vote for the best one in August and September. A $1 million prize will go toward the winning idea. St. Paul artist Ta-coumba Aiken designed the Lite Brite mural to reflect St. Paul's nature. "There's even some St Paul icons, like Sparky is in there -- people are still looking for that one. They can keep looking till they find it," Aiken said. "The State Capitol, the First Bank, the Indian Mounds. And people have been seeing things that I didn't put in there, but that's OK."
The mural is made of more than 596,000 Lite Brite pegs, and more than 600 volunteers helped put it together. St. Paul Foundation president Carleen Rhodes said anyone can submit any kind of idea in the contest. "Who knows how many suggestions we'll get up front, but we're hoping that we'll have hundreds," she said. Eventually, she added that, "it'll be narrowed to three ideas. And then all citizens can vote about the best ideas in August and September."